Deep in the heart of ski country, surrounded by snow and winter tourists, a homegrown tape label lives and thrives. Snowfall Tapes opened its doors in 2013. We’re proud to present this label mix and interview with founder Rick Meredith. To find this label is to find a hidden treasure. Our entry point was Hannah Hoch’s Floeberg, an icy work of experimental drones. When we began to investigate the label’s other releases, we were caught completely off guard. nahsolo’s Beats Vol. 1 was an instrumental hip-hop collection; Pixelgypsy was ambient; Raemou was solidly post-rock. What was going on here? We had to find out, so we wrote back to the label to find out more. When we did, we discovered that the releases were united by a feeling of community and a DIY ethic, two wonderful aspects all too often lost in the modern age. Rick Meredith was generous enough to respond to our request for a mix, which we share below; we invite our readers to play the music while reading. I had been collecting tapes for a while, and had kicked around the idea of starting my own label. Back in September I was thinking about selling a record from my collection, Captain Murphy’s ‘Duality’ which had been selling on eBay for between $100 and $400. I wanted to keep some kind of physical copy of the album, so I ordered a tape that fit the length of the album and dubbed the vinyl over to the cassette. This personal bootleg tape worked so well, and was so fun and easy to make, that it made me really want to do more with tapes. I ended up selling the record for a good amount, and I took the money from the sale and started Snowfall Tapes, completely funding my first three releases, and a bunch of duplication hardware. From that point on, tape sales have made enough on their own to fund new releases and keep the label going. It’s been really, really fun. When I first played your mix, I confused the name of the mix with the name of one of the tracks, “Exit Seven in Winter”. What will I find if I take Exit Seven? Is it really icy? Haha! “Exit Seven” is the name of the Pixelgypsy track on the mix, while the mix is simply titled “Snowfall Tapes Winter Mix”. I think if you were to take Exit Seven, you would find yourself stuck in the middle of a quiet snowy landscape, with ambient electronics blowing through the trees, a droning hum far off in the distance, and cars occasionally passing by, playing brightly colored tapes inside their cars’ tape decks. It would be an excellent place to do some field recording. Are you a skier? Which of your releases is best for skiing? Which is best for watching the snow fall? Which is best to listen to if stuck in a weather-related traffic backup? I both ski and snowboard, it really is inevitable when growing up in snowy, mountainous places, and right now living within 30 minutes of my local ski resort. Each release on Snowfall Tapes does a good job at complimenting the snow falling, each in its own way. When racing down the mountain, Shmuck the Loyal’s Slurr Tapes Vol. 1 is by far the highest-energy release on the label and makes a great companion to fast riding. I find Dankulo’s laid-back electronic beats on ‘Purple Drips’ and Siddiq’s hazy beats on ‘Good Vibes’ go well with jibbing in the park, and the synths on Eureka’s ‘Lifter’ and minimal ambience on Pixelgypsy’s ‘Cold Fall’ make a perfect soundtrack to thick, snowy powder days when riding through the trees. Outside of the mountain, the euphoric instrumentation on Raemou’s Leave EP and the atmosphere-shaping soundscapes on Hannah Hoch’s Floeberg make a great companion to watching the snow fall out my window, while the distorted synth-pop on Girl Milk’s ‘Title’ and the jazzy vinyl sampling on nahsolo’s ‘Beats Vol. 1’ is fun enough to keep me from going insane during any traffic backup. You have an incredibly diverse roster. How do you locate your artists, and how do you choose what to release? How many of the artists have you met? I spend too much time on the internet and on web-based music communities. Part of my initial plan for Snowfall Tapes was to make it an outlet for artists that were active on specific web communities to easily do some kind of physical release. I wanted Snowfall Tapes to support some kind of localized community, as lots of labels support local acts, or specific scenes and micro-genres, but there really wasn’t anyone doing consistent releases within the highly active online music communities I was frequenting. So I started sifting through threads where artists openly share their own music to the internet via Bandcamp and Soundcloud, and began contacting artists that I really like, asking if they want to do a tape release. It’s unbelievable the amount of awesome, innovative stuff that gets poured out by artists on these communities, and I was really tired of not being able to own copies of the stuff I liked the most. Most of the artists on Snowfall Tapes are connected to each other in some way, through posting on the same forums, being a part of a ‘virtual’ local scene that doesn’t see nearly as much attention as it should. The majority of the interactions and connections I make this way are purely online, so interacting with the artist is often done entirely through email conversations. At first it was a little weird, and I still have problems conveying tone and tact just with typed text, but so far it’s worked really well. I know what a snowfall is, but what is a “tape?” What led you to choose this format? A couple of your tapes contain obvious ironies: for example, Floeberg is an icy release that was recorded in summer, and Schmuck the Loyal lists their music as having been recorded in 1995, when it was actually recorded in 2013. Are there any other “inside stories” you can share? When initially looking for artists that I wanted to do releases with, I found nahsolo and wrote out an email to him proposing a tape release, but never actually sent it (but I thought I did) and for the next month I waited eagerly for a response from someone I never actually initiated contact with. Out of pure luck, he found my label and sent me an email a month after asking if it was possible to release his music through Snowfall Tapes. Since we both frequented the same websites, it wasn’t as big of a coincidence as it sounds, but it’s still pretty wild. – All the dubbing is done by me on four different semi-vintage (but very well maintained, very high quality) tape decks in real time, almost nothing is automated, and I adjust the volume and audio levels by hand every time I dub a different release, essentially making each and every tape completely unique. When someone buys a tape from Snowfall Tapes, there is no tape that sounds exactly like it in the world. Even the printing is done on-demand, with slight differences always existing between each packaged tape. – The alternative name for the label when first starting up was ‘Lithium tapes’. – All the logos I currently use for Snowfall Tapes are photos of doodles I’ve drawn in my notebooks, lightly refined in photoshop. Eureka’s tape was your first release, and “Let’s Do Things” is the first song on that release, as well as the first song in your mix. Does the song’s monologue have special meaning for you? There’s another inside story here: When I was trying to make this label happen, I was filled with thoughts of imminent failure, of hope, of not knowing what the hell would come of trying to start a tape label. The sample of James Murphy in Eureka’s ‘Lets Do Things’ reflecting on failure, uncertainty, etc. was a perfect companion to all my thoughts during this period, and immediately clicked with me when I listened to it. When Eureka replied to my email, expressing interest in the release, I was extremely excited that it was going to be the introductory track, preceding all future tracks, on Snowfall Tapes. I don’t think there could have been a more perfect introduction to what was going to be my first release. Essentially “Let’s Do Things” is a song that elicits emotion, and makes for a powerful introduction. It is in every way a perfect track to start a mix with. Please tell us a little about what we can expect from Snowfall Tapes in 2014. 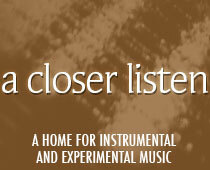 A Closer Listen thanks Snowfall Tapes’ Rick Meredith for his music and his time! For more, visit the label here: Snowfall Tapes. Big ups to Pixelgypsy for getting a little speculation with “Exit Seven”.